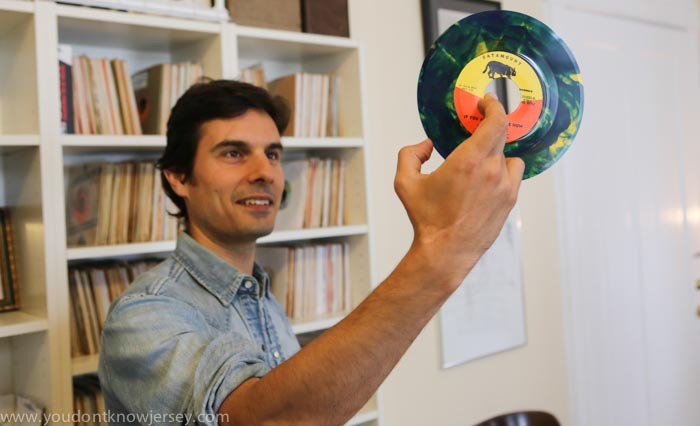 When our friend Alan “Sucia” Smith of the Montclair band The Porchistas told us about a record collection we had to check out we didn’t waste any time making contact with Jeff Marino. What we heard from Alan about the collection really impressed us so we headed to Jersey City on a cloudy Sunday morning. Marino is a guitarist/vocalist with the rhythm & blues/soul/rock outfit The One and Nines. 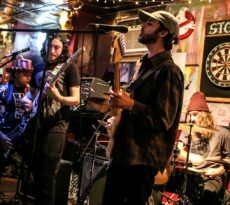 Named for the busy roads that course through much of New Jersey, the band plays a modern rhythm and blues that pays respects to the glory days of Stax Records and Motown Records. 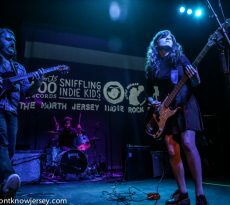 Lead by the soulful and funky vocals of singer (and Jeff’s wife) Vera Sousa, they have been bringing the groove to venues all around New Jersey and New York for almost a decade. 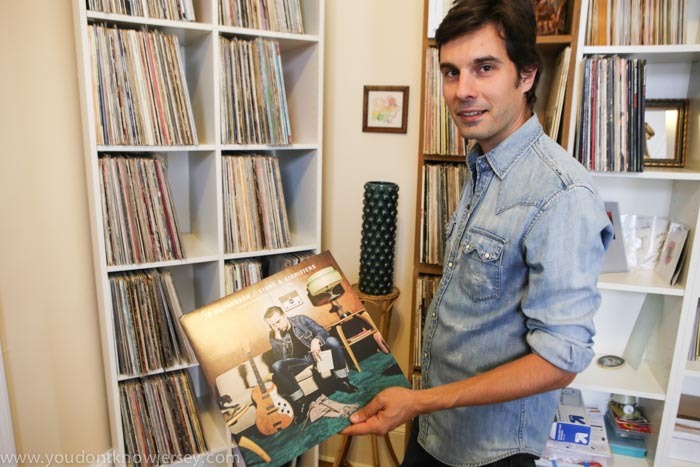 Marino is serious about his record collecting. 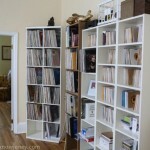 Walking into his home the first thing that caught my eye was the shelves and shelves of records. They are the centerpiece of the living room. 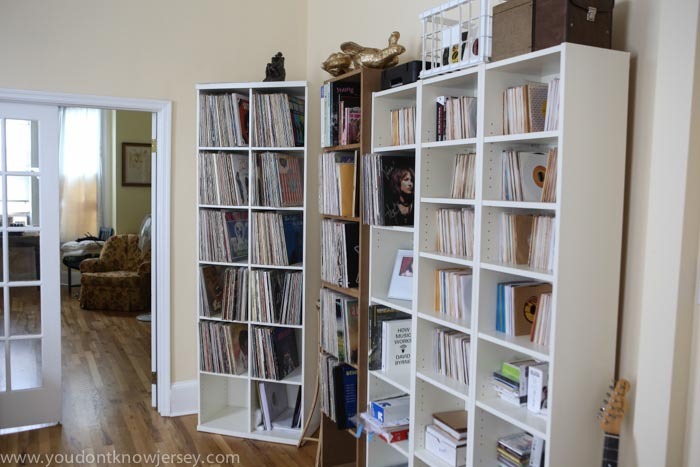 In fact the room is pretty much dedicated to music—turntable and stereo, guitar, Beatles poster. Just talking with him in the first few minutes I could tell he was both very knowledgable about music and thoughtful about the way he goes about buying and organizing his records. This isn’t just an alphabetized collection. They’re first organized by region—New Orleans, Chicago, etc.—then alphabetized. I got the feeling he could talk about records all morning and that would have been fine with me. 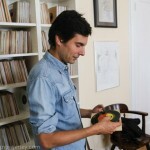 I asked Jeff to pull some of his favorite records and 45s. This is always a difficult task for a collector. 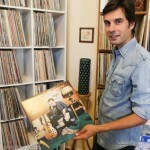 Not to pick the most important records but the most meaningful to them. One of the first discs he showed us was a recent acquisition that he was proud of. It was Mirror Image’s ultra rare, garage psychedelic “No Lovin’ Man” released on Stan Krause’s label Catamount Records in 1967. 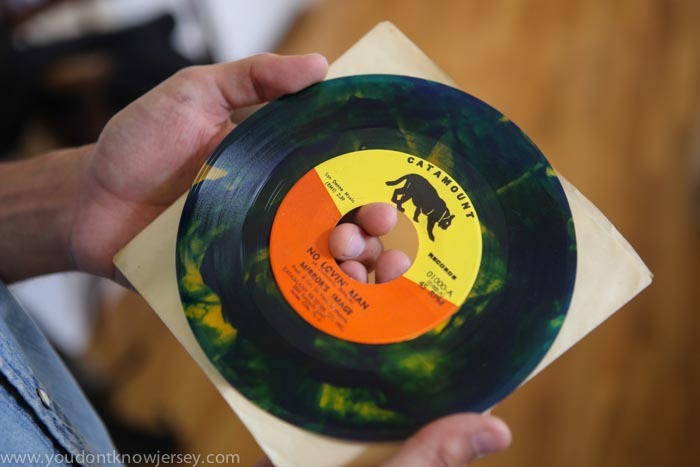 An interesting release from a label specializing in acappella, the 45 was quite striking with its green and yellow marbling. 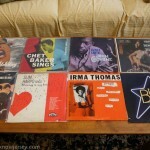 Jeff played the great fuzz-rock single for us before scouring his stacks and choosing the others below. Them “featuring Here Comes The Night” – Parrot – Their first album. Original mono pressing. What a sound! Love this album and everything they did. Chet Baker “Chet Baker Sings” – Pacific Jazz – Another original mono pressing. Beautiful album that’s a such a pleasure to listen to in it’s original format. This gets a lot of play in our house. Billie Holiday – Commodore Records – An LP compilation of her sides recorded for Commodore. Some of her greatest recordings. Love the cover on this one. John Coltrane “Lush Life” – Prestige – Original mono pressing. see a trend? Love listening in mono. 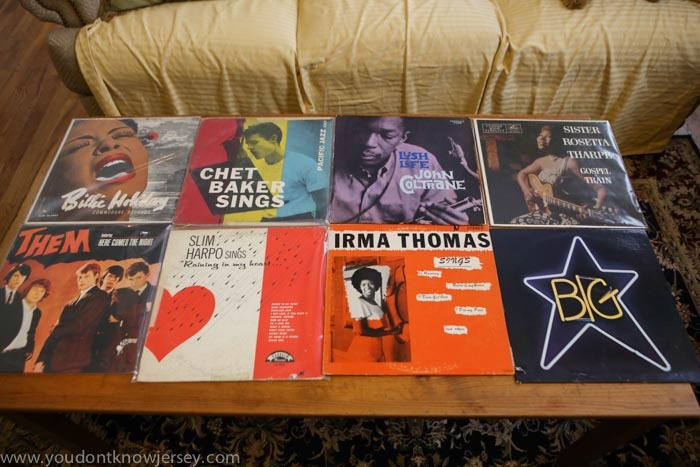 That’s how these records were recorded and intended to be listened to when first released. I’m not a big jazz collector or aficionado but I do love listening to the great jazz records in their original mono glory! Irma Thomas “Irma Thomas Sings” – Bandy – An out of print compilation released in the late 70’s of Irma’s 60’s recordings done for the Minit label. The songs on here were all originally released on 45. Brought this home from one of my first trips to New Orleans as a gift for my wife, who was not yet my wife at the time, but this sealed the deal. Big Star – #1 Record – Ardent – One of my favorite albums and in my opinion a great example of a record that sounds completely different on the original vinyl compared to the CD. I was never crazy about how the CD release of this album sounded and it’s like night and day to me when you listen to the original record. I think the Big Star albums are due for a re-mastering and re-release. Slim Harpo “sings Raining In My heart” – Excello – Swamp blues legend. I think this is his first LP after releasing several singles. The Stones and Them and many others covered his songs. Just a real cool album. Down home and raw R&B. Sister Rosetta Tharpe “Gospel Train” – Mercury – Singing and guitar slinging gospel powerhouse. One of the greatest and arguably the first guitar hero. Incredible. Look up some of her performances on youtube if you haven’t seen. This is one of her best albums released during her heyday….in mono. 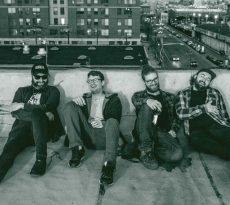 Mirror’s Image “No Lovin’ Man” – Catamount Records – We already spoke about this one. 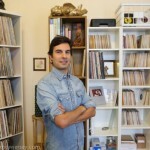 Here’s a little about Stan and his store and label. The Pams “That’s My Baby” – Catamount – Another rare one from the local label. this one is a girl group / r&b record. the lead singer was apparently only 12 yrs old at the time. Levon & The Hawks “He Don’t Love You” – Atco Records – The Band before they were The Band. From 66 or 67. Another example of my musical influence worlds colliding. I mentioned the r&b vocal group The Persuasions from Catamount who did a doo-wop Grateful Dead cover album. The Band is another group I grew up listening to as a kid and here they are doing an all out killer soul 45. 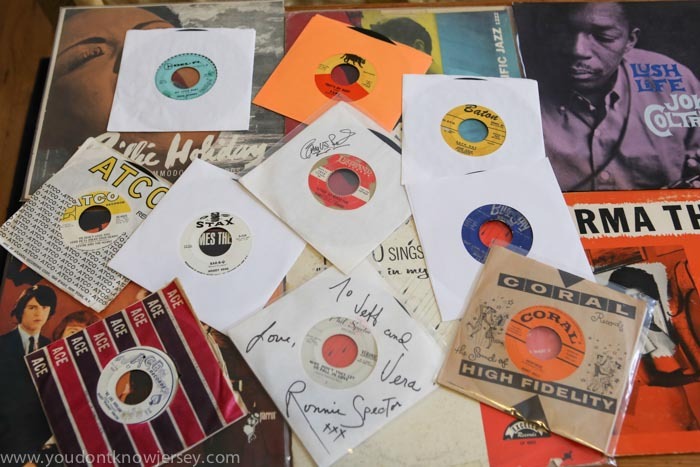 I basically got into r&b music and 45’s from seeking out the influences of the bands I loved, like The Stones, The Dead, The Band, Dylan….gateway music for me. And when The Band were The Hawks they were all over the early 60’s r&b and rock & roll scene and they were wild. They toned it down a bit once they became The Band but their r&b roots were always there. Wish they did a couple more 45’s like this one at the time…. Wendy Rene “Bar-B-Q” / “Young & Foolish” – Stax – One of my favorites from one of my favorite labels of course. Chan Romero “My Little Ruby” Del-Fi – More well known for his “Hippy Hippy Shake” but I love this one. one of the greatest Rock & Roll records ever in my opinion. Love the guitar. It’s usually categorized as rockabilly and it is, but to me it’s just Rock & Roll. Eddie Bo “Our Love Will Never Falter” – Blue Jay – One of my favorite artists and one of the most underrated and criminally unknown artists there is. So many great records by him that have never been properly re-released, if re-released at all. Apparently the only New Orleans artist that put out more records than Eddie was Fats Domino. Yet outside of New Orleans most people haven’t heard any of them, or him. He was an equally great singer/piano player/songwriter/producer/arranger. This is one of his greatest and also one of his rarest. Kind of an expensive record and mine is not in the best condition but it does the job! Huey ‘Piano’ Smith “We Like Birdland” – Ace Records – Just another great New Orleans record. 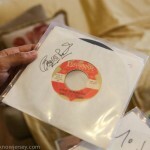 Buddy Holly “Heartbeat” / “Well… All Right” – Coral – One of his many great records. Ann Cole “Each Day” / “In The Chapel – Baton – From Newark NJ she recorded some of the greatest R&B sides in the late 50’s early 60’s. She did the first version of “Got My Mojo Workin” which was made famous by the Muddy Water’s version, but the first one was done by her, a lady. She also had a hit with “Don’t Stop The Wedding” the answer song to the Etta James record. This record “Each Day” is smokin’ and features some wild guitar work by Mickey Baker, one of my favorite guitarists. 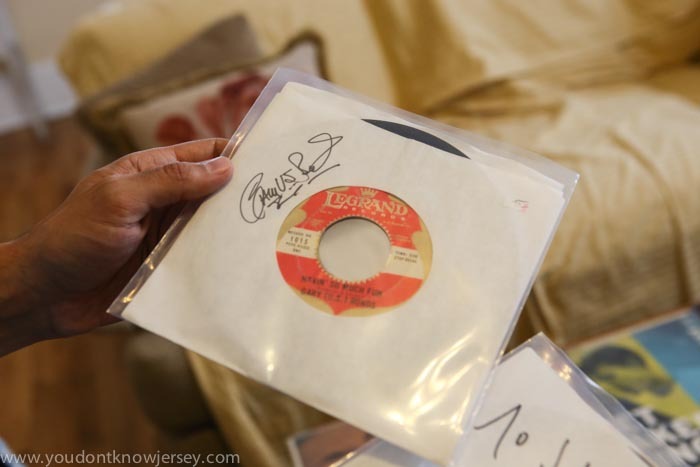 Gary US Bonds “Havin’ So Much Fun” / “Dear Lady Twist” – Legrand – Love all his records. he signed this one for us when we met him a few years ago at a gig he played at Iridium in NYC. 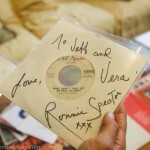 Veronica “Why Don’t They Let Us Fall In Love” – Phil Spector Records – Love all her records too. this one is great. not originally released as The Ronettes but just Veronica. 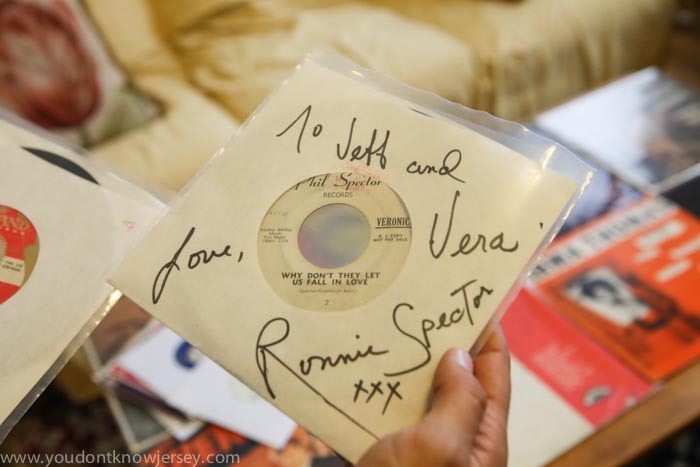 We met her at the WFMU record fair a few years ago and she signed this and kissed it of course. Lipstick is still there! She also said I was handsome! 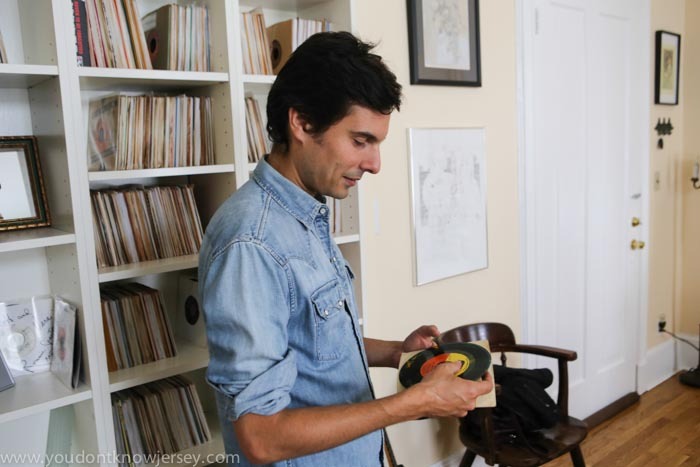 Jeff sat down with us over coffee and talked about records, Jersey City, and rhythm & blues. 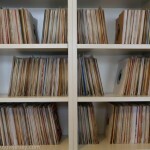 When I first really got into collecting vinyl I guess I was probably 19 0r 20. I grew up listening to cassette tapes mostly. 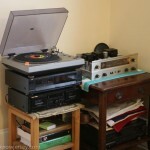 Which is a similar thing to vinyl, compared to what younger kids listen to these days online, as you have to put it the stereo, fast forward and rewind and find the song you want to listen to. I was always so into music, had thousands of CDs and tapes me and my brother. 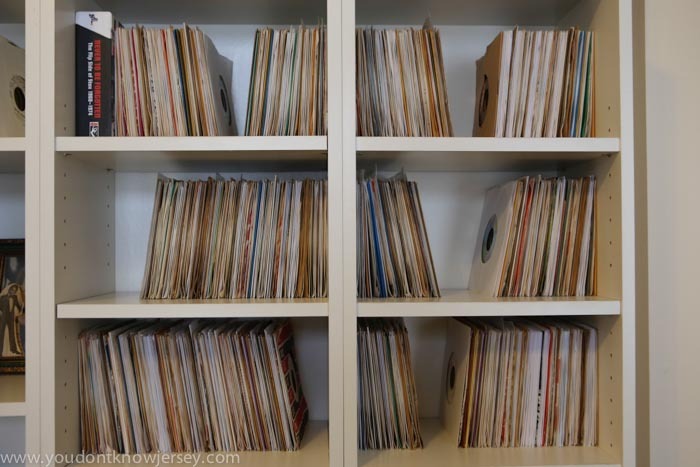 When I started moving to vinyl, I remember my first trip to Europe. It was summer in college and I came home with a stack of LPs. 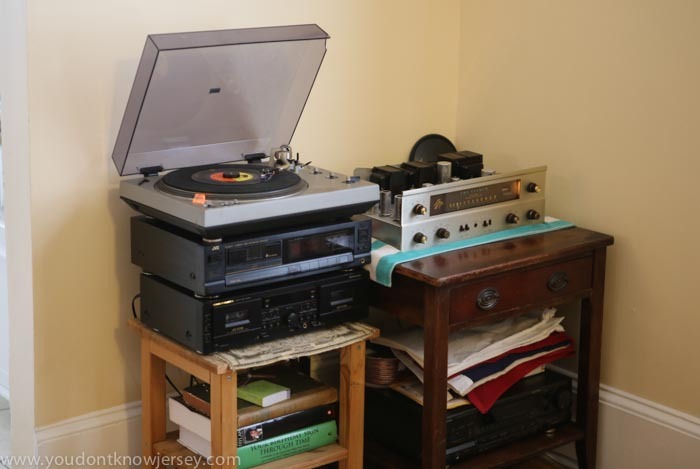 60s soul stuff and Wilson Pickett’s first album on Atlantic. It took off from there. Well I don’t usually just buy one. I try to control myself. I was at Iris Records the other day and I was at Tunes the week before and I got an LP I was really happy about of the original pressing of Billie Holiday on Commodore. Red label recording in the mid-late 40s. Mose Allison on Atlantic. Those are two of my favorite artists. What are some other good record stores in the area? Where do you shop? Honestly I try not to do so much shopping locally because when we are traveling I like to check out those places and splurge. We are taking a trip to Chicago so I am saving up some money so I can shop there. 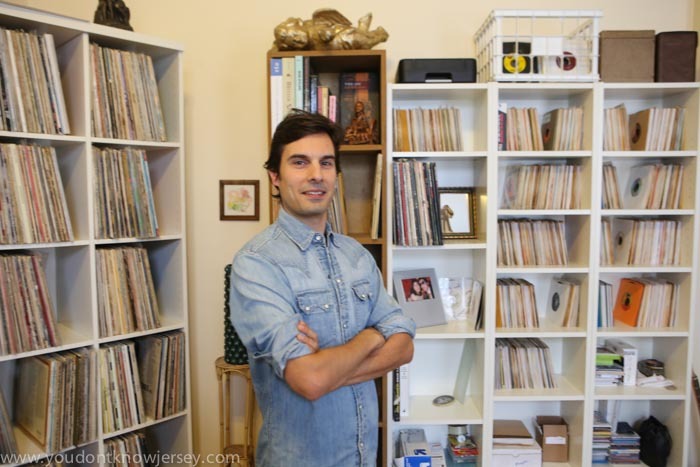 Locally there is Stan’s Square Records on Bergen Avenue. He’s been there since the mid-60s, original location on Kennedy. 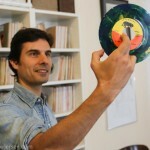 He has a record label called Catamount Records and he put out a lot of acappella and doo-wop. It’s an old school R & B record store. It’s my favorite spot around here. What is it about Rhythm & Blues and Soul that still makes it vital? I can certainly elaborate for a long time on this one. There are few people that really perform and play that way, and record that way. And that still connects with people. 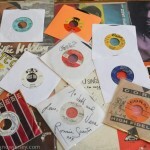 Soul music is simple, getting right to the point. You took your name from routes running through town. What do you love about Jersey City? I hate to use the expression “the lost borough” because it still is Jersey but it is the Jersey side of New York City. Though it is definitely changing a lot, especially in the last year or two, certainly in the last 6 to 8 years, it still has a little of that down home feel. It is just as close to Manhattan as Brooklyn is but it still feels like a small town in a lot of ways. I grew up in Elizabeth so I have a lot of roots in this area. You do something with WFMU and the Prove It All Night show with Pat Byrne? Pat is a friend of ours and his show is awesome. It is really cool he is doing something like that. He had been talking about having me on the show for a while. We had deejayed a few nights together over the years and it was always a lot of fun. The show used to be from 3:00 to 6:00 AM on Tuesday or something like that and he kept trying to get me on. I was like “I’ll get there eventually”. But now that he is on Saturday nights he called me up and said come on in with a box of records. It was a lot of fun. You have quite a 45 collection. 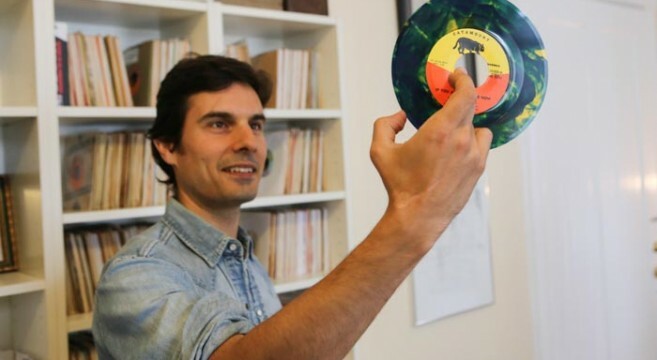 What is it about 45s that make them special? They have a bigger punch that the LPs. Not only that but a lot of the music I listen to the LPs were more of an afterthought. That was the record industry in the 60s. They were putting out 45s. 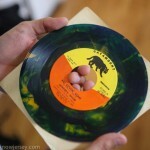 Then if somebody had a hit then they would gather their 45s and put the on an LP. A lot of the artists I am interested in most of their catalogs when they were in their heyday was put out on 45. Also a lot of the more obscure R & B artists never put out an LP. They put out three or four 45s and that was it. 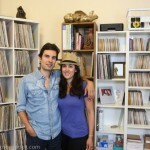 Visiting local artists like Jeff and taking in their record collections is endlessly fascinating. I love learning about the music that inspires the local musicians that inspire us. 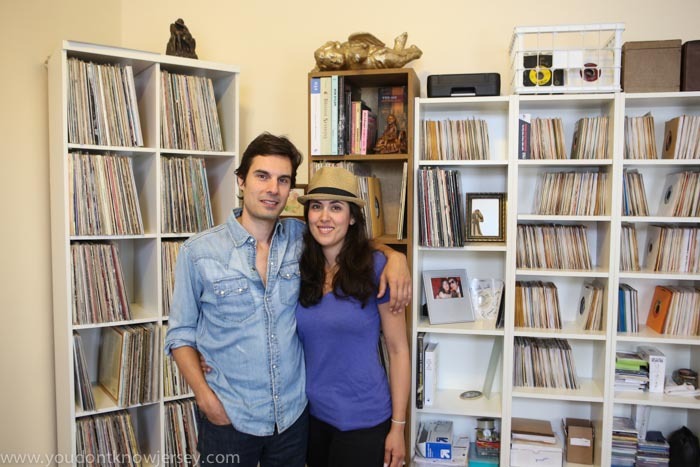 The vinyl collectors especially provoke great conversation. As they did on this day.